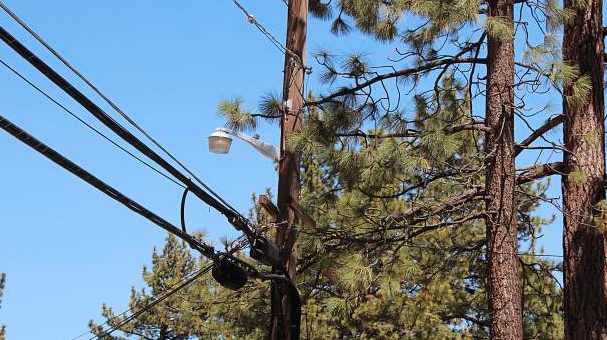 Liberty Utilities is increasing its efforts to identify and remove hazardous trees within its service area in the Tahoe Basin. Liberty Utilities recently announced its intent to ramp up efforts to identify and remove dead and dying trees that pose a risk to the utility’s infrastructure. The announcement comes at a time when California’s forests continue to reel from the effects of drought, disease and infestation. In the span of a year 27 million trees died across California due to drought and bark beetles, bringing the total number over the last 10 years to an unprecedented 129 million, the Tribune reported in December. In its announcement, Liberty said it has tripled the number of inspectors used to identify potentially hazardous trees. The program is designed to reduce the risk of power outages, potential wildfires, and to comply with state regulations. Last month, state fire officials confirmed that trees coming into contact with Pacific Gas & Electric Co. power lines started four Norther California fires which eventually grew into the deadly wine country fires, the Associated Press reported. The California Department of Forestry and Fire Protection indicated that three of the fires might have been prevented if PG&E had made a greater effort to keep trees clear of its power lines. Liberty Utilities has been authorized by the California Public Utilities Commission (CPUC) to spend up to $2.5 million each year on vegetation management programs in order to maintain the CPUC requirement to keep trees, branches and other vegetation surrounding utility infrastructure trimmed back to reduce outage risks. Qualified tree inspectors are currently working along the 57-mile length of Liberty’s power line that serves the Tahoe City area. As high-risk trees are identified, another contractor will remove the hazards, according to the utility provider. Jones noted that any tree on private property that must be removed remains the property of the landowner. Liberty Utilities’ contract crews will remove the tree limbs and dispose of them, but the tree log itself belongs to the property owner. Jones expects that crews will continue their work in the Tahoe City area throughout June and will continue working along the West Shore and other parts of the service territory affected by tree mortality as long as necessary. More information about Liberty Utilities’ vegetation management program can be found on its website at http://www.libertyutilities.com under the Safety link at the top.